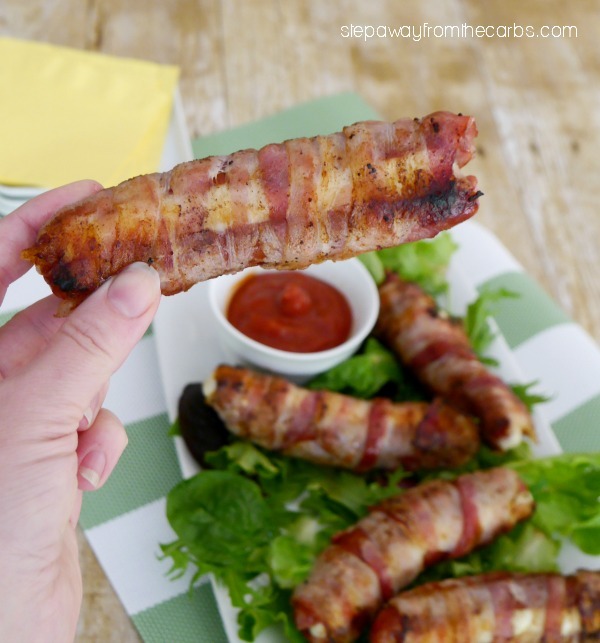 Bacon-Wrapped Cheese Stuffed Brats – yes really! They’re absolutely perfect for low carb and keto grilling! 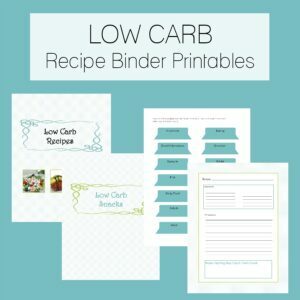 Oh those low carb diets – every recipe seems to include bacon and cheese! 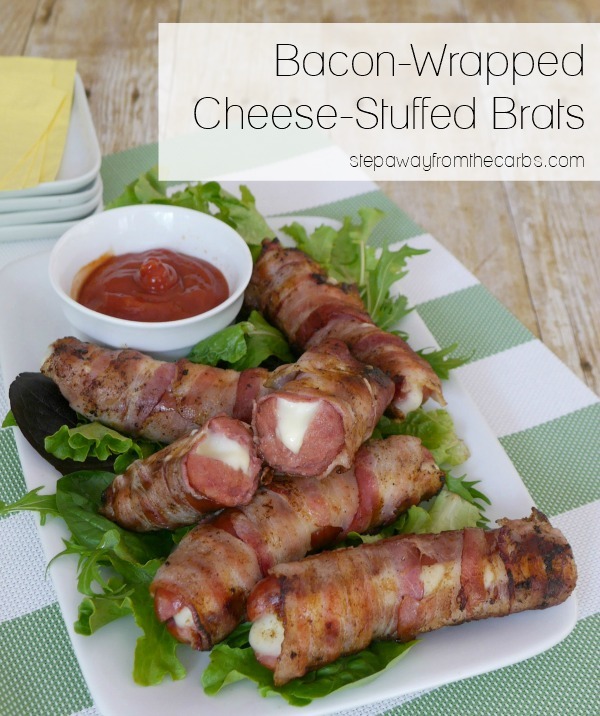 Well yes – because bacon and cheese ROCKS – especially together! 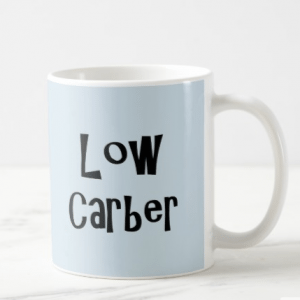 If we’re going to be deprived of carbs, we’ve got to get our kicks elsewhere!! So we’re completely in grilling season right now – and will firmly remain there until at least September! And with bacon and cheese in mind, I wanted to make some smoked brats EXTRA special. 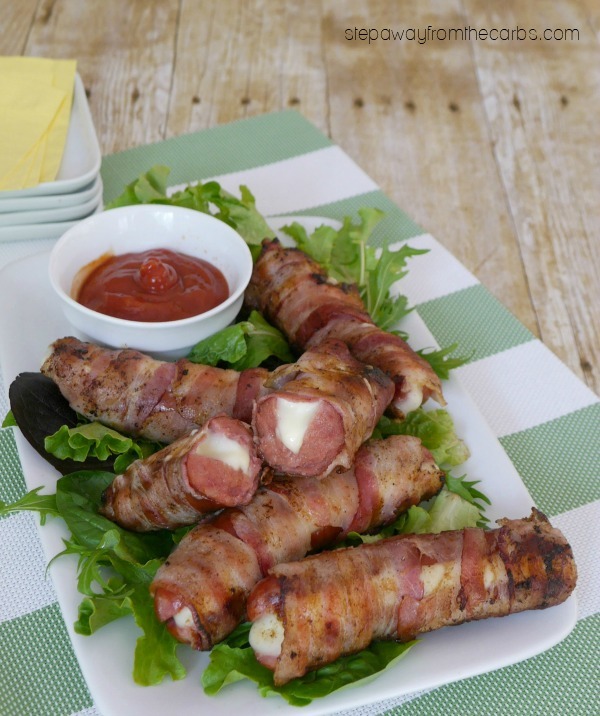 And what could be better for a low carber than stuffing them with cheese, then wrapping them in bacon?!? Now these weren’t any old brats – most of you know that I have a long term affinity for the European-style products from Klement’s. 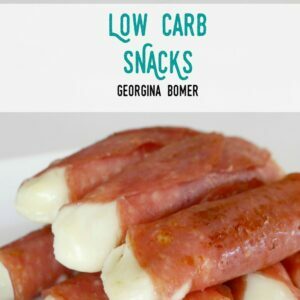 They make premium fresh sausages, snack sticks (see my corn dog muffins), cocktail smokies (like I used in my festive Pigs In Blankets recipe), Polish sausage (it works perfectly in these sheet pan meal), bacon, summer sausage (you’ll love these baked sausage and pumpkin appetizer bites), and more! 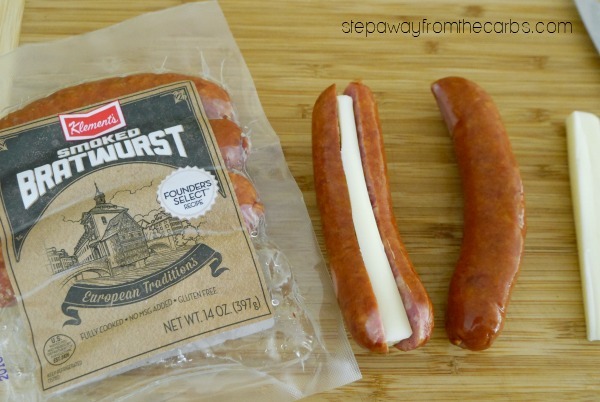 One of their most popular products is their brats, and they have four different varieties! I chose the smoked bratwurst – the smoked part works well with the essence of outdoor cooking, the great quality means it is lower in carbs than many other brands, and the fact that it is pre-cooked REALLY helps when it comes to grilling and make sure everything is cooked through! SO. Slice each brat lengthways, but not all the way through. Then cut a mozzarella cheese string stick in half lengthways, and place it into the brat. And yes – there are five brats to a pack, so there will be one half of a cheese string left over – good snacking for the chef, I think! 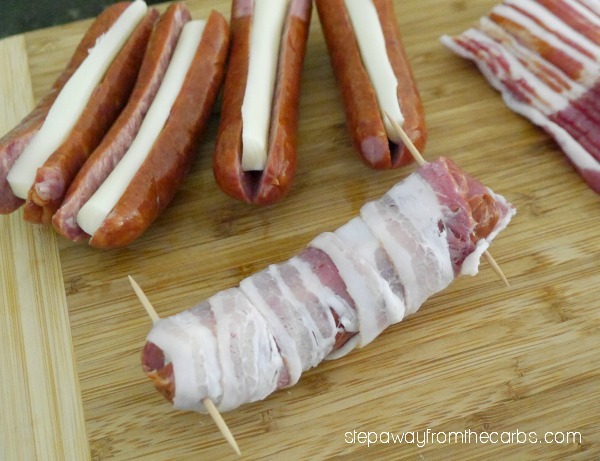 Next, wrap two slices of bacon around the whole length of the sausage. If you’re preparing this in advance, you can stop here. If you want to cook right away, you will need some pre-soaked wooden toothpicks – and yes they need to be pre-soaked for at least an hour to reduce the chance of them catching fire on the grill! So you may need to plan that part in advance. Secure each end of bacon with a toothpick. Place each brat cut/cheese side down on the grill. Because of the natural curve of the brat, the center will be the hardest to cook, so you may need to press down to get the bacon to crisp up. Once that side is cooked, flip it over. Continue to cook, and this time you may need to press the curled-up ends down onto the grill. Carefully remove the toothpicks, then you can cook the remaining two sides – which are a lot easier! This is quite labor intensive grilling, I’m afraid – unlike when I recently tried cooking ribs on the grill for the first time! Oh – and you could also cook these inside on a grill pan – I love my non-stick Anolon! When all four sides of bacon are cooked, you’re ready to enjoy! 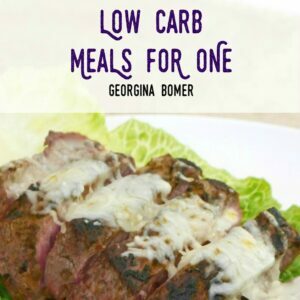 I served this with a slightly smokey spicy ketchup – which was a super simple low carb ketchup (you could use Heinz Reduced Sugar Ketchup or G Hughes ketchup) mixed with a little chipotle powder! Pre-soak 10 toothpicks in water for at least an hour. Slice each brat lengthways, but not all the way through. Then cut a mozzarella cheese string stick in half lengthways, and place it into the brat. 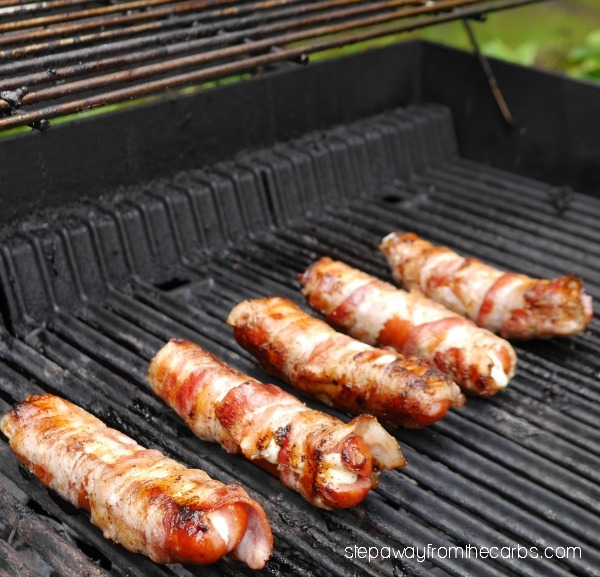 Wrap two slices of bacon around the whole length of each sausage. Secure each end of bacon with a toothpick. Place each brat cut/cheese side down on the grill. Because of the natural curve of the brat, the center will be the hardest to cook, so you may need to press down to get the bacon to crisp up. Once that side is cooked, flip it over. Continue to cook, and this time you may need to press the curled-up ends down onto the grill. Carefully remove the toothpicks, then you can cook the remaining two sides. If you like, make a simple spicy ketchup by mixing a little chipotle powder into the low carb ketchup. 4g net carbs per wrapped sausage. Spicy ketchup not included in the nutritional data.